Sitting under the canopy of trees, I listen keenly to Madhavan, the priest of the Mela-Kaav (Upper temple) as he narrates a string of fascinating mythological stories. The quaint village of Palloor near Thalassery, was gearing up for its beloved and cherished form of worship; unique to this (Malabar) region of Kerala and coastal belt of Karnataka where it manifests itself as ‘Bhootakola‘. I was here to get my first ever ‘up-close’ experience of one of the most ancient and traditional art of worship-the Theyyam. Infact, Theyyam, I am told, is considered to be a form of Upasna or the attainment of God itself! At the Koyyodan Koroth temple premises, the preps have begun. A temporary Aniara (changing room) with thatched coconut palms is erected at one end. A huge pandal with enormous vessels containing prasadam in the making, stands adjacent to it. This auspicious food would be first offered to God and then served to more than a thousand devotees at lunch the next day. In a few hours, a series of Theyyams would commence and continue through the night into the next evening with intervals in between. Small groups of bare chested men sat on the muddy ground ripping delicate strips from coconut palm fronds to create the outfits for the performers. A 30-feet long skeleton made of cane is being festooned with identical shapes cut out of palm leaves. Costumes and ornaments made of metal and glass hung on ropes shimmer in the light of the afternoon sun. Inside the Aniara, faces are being smeared with bright orange paint and sketched with delicate, almost invisible patterns and outlines. Few artists painted their faces themselves, looking through tiny bright colored mirrors in their hands. Their eye sockets are daubed with jet black. As the performers get into their wardrobe, they are adorned with ornaments and garlands. Their head gear is secured tightly on their crown amidst final touches. Everything around is happening with lightning speed and precision. As I move around in cramped spaces to click all the action, I meet curious eyes, friendly smiles and mouths uttering repetitive questions. Strong whiffs of toddy fill the shed. Finally, by late evening the first set of Theyyam performers- namely, the Gulligans are ready for the show! Hover over the image for captions.. Meanwhile, at the Thazha-kaav (Lower temple), the chitter-chatter of an impatient crowd is infused with the energetic beats of the Chenddas, Ilathalams and Kurunkuzhals*. The Gulligans parade towards the arena; their jewellery clink-clank as they pass by. After seeking blessings from the idol under the oak tree, they take their positions on stunt wooden stools. Chanting prayers, they begin spinning on their stools. The speed of their rotations increase as they jump on to the ground. It feels like being in the centre of a field with spinning red tops rotating and revolving with varied intensities. Towards the end, a Gulligan is led towards a burning heap of charcoal a few meters away. He kicks the pile with his bare feet multiple times. With no control over his consciousness any more, he faints and falls to the ground, but is immediately held by the mob of people who seem to be anticipating the act. This marks the cease of the Gulligan Theyyam. A series of other Theyyams follow through the night and as the performance gains momentum, the degree of spiritual transcendence also rises. During the Vishnumoorthy Theyyam, the lead performer dances to the rhythm of the Chenddas with various props like swords, hand mirror and shield. His eyes are loaded with hideous expressions, more like a sly wild animal of the night. After almost an hour when the performance finishes, a line of devotees queue up to seek blessings from Vishnumoorthy who has now attained a state of Godliness. Advices on issues and questions of the future are being answered. In return money is tucked into his palms. By 10 am, a serpentine queue has already lined up for lunch, getting longer by the second! At the arena, a set of five Kandakarnans arrive; dressed in skirts made of green and cream palm fronds. Their face masks resemble demons. My eyes follow the never ending tower of head gear worn by the men. Standing almost 20 feet tall, I struggle to fit them into my frame! Little did I know that the cane skeletons that were being decorated the previous evening were actually the head gear! The Kandakarnans have a pair of bamboo stilts each in their hands. As the beat of the Chenddas gain momentum, the key performer takes to centre stage and dances on the stilts with swift and quick movements. The stilts added another 5 feet to his height, but his balance is astounding! The rest of them dance in a similar fashion, minus the stilts. The crowd, now tripled, impatiently awaits the grand procession of the 40-odd Kuttichathans. After about an hour of wait, the vivacious performers finally arrive- dressed in vibrant orange and red, rectangular, box shaped skirts. Props are being secured to them, one by one. First up, massive wings made of wood and glass, impersonating a peacock, is tied to their backs. Then, face masks with intricate designs, mimicking an elephant head covers the faces. Protruding silver eye gear having a tiny opening is secured to the mask. Their chests are bare and so are their rounded bellies with circular designs painted all over. One by one, all the forty Kuttichathans circle the temple premises in a swaggering gait, climb up a concrete block in front of the deity, spin around, seek blessings and perch themselves on the wooden stools. They sip a drop of holy water off a ‘Pan’ (beetle leaf) before commencing their performance. Holding the hands of the helpers for support, they sway their heads and bodies like an elephant and swing back and forth like a dancing peacock. One can easily assume the weight of their costume. They let out intermittent bouts of roaring, demonic laughter. Placing their fingers onto the burning ‘Mashaal’ (flambeau), they rub ash on their fingers and smear it onto the heads of random devotees coming their way. Koyyodan Koroth temple looked more like a fiction movie filled with creatures not belonging to this planet. Half way through the performance, almost all the Kuttichathans reach their peak of trance. After what seems like ages, the rigorous beats of the Chenddas cease, making way for a re-run of the ritual of blessings and fortune telling. Hover over each picture for the caption.. Final get-up of a Kuttichatan. In the interim, tonnes of fresh logs that had burnt all night had transformed into a huge heap of burning grey charcoal. The Ucchita Bhagavati Theyyam comprises of the artists performing around and sitting over the burning pyre for several minutes, flag the end of the 2-day long ceremony. Though I miss the performance in the interest of time, my journey would continue to other parts of Malabar where I would meet the Gods who descend in more elaborate forms like the Mucchillot Bhagavati. 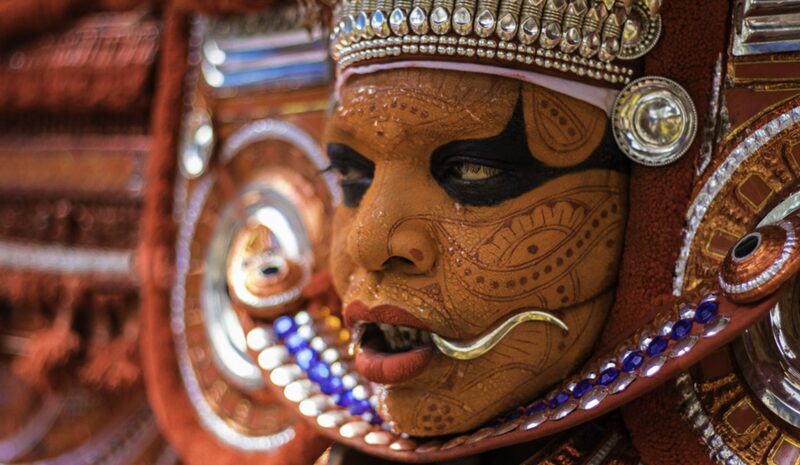 The origin of Theyyam can be traced back to the 13th century or perhaps, even earlier. Manakadan Veliya Gurukkal, the Aashrit (dependent) of the King, Kolathiri Raja, is believed to be the first tutor of Theyyam. Theyyam is a family run tradition and is passed on from one generation to the other; the teachers are usually from the same family or community. Theyyam deities are believed to have been formed from 7 cults namely Shaiva, Vaishnava, Shaktheya, Gananatha, Aryaka, Guha and Stithinashakara. There are around 400 characters or Roopams of Theyyam, each descending from a legend attached to it. Madhavan (the priest of Mela-Kaav) exclusively narrated the story of Kuttichathan and Muthappan. Kuttichathan was the son of a Namboodri (Brahmin) who went against the rules and customs of his cast and family. He often got punished for his deeds. One day, upon being scolded and insulted by his father, Kuttichathan set his house ablaze. Wild with anger, the outraged Namboodri chops off his son into 280 pieces and throws it into the forests. The chopped pieces come alive as 280 clones of Kuttichathan, possessing divine powers. Similar myth prevails about Muthappan, again a spoilt son of a Namboodri and a sorcerer, who was asked to leave his home. Obeying the order, Muthappan decided to leave for a place called Punvathur. On his way he climbed up a toddy tree and started drinking toddy from the pot tied to the tree. The toddy owner or ‘Kalluchettukaran’ named Chandan, caught him during the act and objected to the theft, to which, Muthappan, with his witchery, turned him into a statue. Later, upon Chandan’s wife’s pleas, Muthappan brought him back to life. Such are the interesting thread of stories attached to each Theyyam! Theyyam performers are usually from the lower sects or communities. Every sect has a few varieties of Theyyams reserved for themselves. For instance, Mucchillot, Nagabhagavathi, Paradevata and Vishnumoorthy are performed only by Chettiars or Nairs, while Muthappan and Kandakarnan are performed by Izhvaah’s (Pronounced as Irvaas). Of all Theyyams, Mucchillot Bhagavati is the most elaborate and favourite form, followed by Kuttichathan which usually has a minimum of 39 performers dressed identically! Since Theyyam is only performed by men, they take up the roles and attires of women characters too. A Theyyam performer is considered to be an incarnation of God and hence has to follow strict rules or Vridhams pertaining to his lifestyle, like refraining from meat and alcohol, leading a life free of theft and sins etc. Around the days nearing the actual performance, their food consists strictly of fruits, green gram and coconut water in bare minimum quantities. On the day of the performance, there is no intake of food. Water is taken in sips from a miniature brass jug called ‘Kindi’. The heavy and elaborate costumes make it impossible for them to use the washroom for the entire day. Costumes comprise of makeup, ornaments, attire, masks and head gear, primarily in shades of bright red, orange and yellow. Ornaments are usually made of brass or white metals and flowers. The performers attain a state of trance during the performances. They are considered as immortals during the event, often thronged by the devotees for advices on their future and fulfilment of wishes. Theyyam is broadly classified into three parts and usually spread over 3 days. Day 1 : Natathira Orthottam : Comprises of vocal admiration and minimal dance. Day 3: Kaliattam or Theyyam which is more action packed. Of which, Kaliattam happens once in 12 years! *Prasadam– a devotional offering made to a god, typically consisting of food that is later shared among devotees. My heartfelt gratitude to Mr. Mahadevan for the beautiful insights on Theyyam and its folklore. Many thanx to Lijit for all his help on arranging my visit and stay. For Theyyam at Koyyodan Koroth temple, you can reach him on 9846820996. I thank Mini and her family for the warm hospitality rendered to me during my stay. To be continued with Mucchilott Bhagavati…. As usual there is surprise in store for the reader.Me for one had never imagined that such colorful event is hiding somewhere in India.Though I am not expert on our various cultures and festivals.Still this has come as pleasant shock for me.This has so vibrant colours especially the head gear is exclusive and impressive.Your photography has taken impressions of it to a degree higher level.Only one may regret ‘I should have been there to experience it live’. Cant thank you much for your words.. Wonderful capture of Theyyam. The colours of those dancers are what makes it such an attraction you have captured them well. Reds, Ochres, Yellow are the dominant colours and they are truly attractive. Late evening and low light would have worked better as it makes the Bheebhatsa rasa of these incarnations more mesmerizing. Daylight, in fact, reduces their impact. Thank you for such a detailed insight on Theyyam. Yes, as you rightly said, my experience would have been better in low light and at night, hence my blog indicated a certain sense of incompleteness. I hope to capture the essence during my next trip to cover Mucchilot Bhagavati. The start of my blog does specify that it is a form of worship..moreso, an Upasna. However, I have modified the introductory para adding a bit of info on Bhootakola. Your details of theyyam have enhanced my knowledge, thank you very much for reading through and taking time out to place inputs to enrich my work ! Really appreciate it ! I agree with your experience. Even my experience with theyyam was exactly like yours. In fact, I felt it was more like a drama-dance for the sake of the public view. I came back with an exactly similar story as you heard. But my research with few of scholars who did research in Bhutas told me that it is the Bhutas which are precursors of theyyams. malayalam script originated from Tulu script and the priests of the most of the Kerala temples are originally from coastal Karnataka districts. That made sense. So Bhutas which still have some amount of pre-historical traits are the precursors of more stylized version similar dance form in Kerala in the form of Theyyam.